The first time I ever had congee was in San Francisco back in 2005. I went on a trip with my boyfriend’s (now husband) family to visit his grandmother. This side of the family grew up in Hong Kong before moving to the United States, and one of their main breakfast staples was good ole Chinese congee. 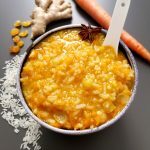 To be honest I was never impressed, I think part of my struggle was that I didn’t grow up with a ton of savory breakfasts and my only experience with anything porridge-like was cream of wheat, which was always topped with brown sugar, butter, and fruit. So, when the bowl of pork, egg, and scallion rice soup was put in front of me I was a little suspicious. It took me years to get on the soupy-savory-runny congee train. My husband and his family LOVED this stuff. Well, now that I think about it I’m not sure if they loved the actual congee or the mountain of deep fried Chinese donuts that they dipped into it. Congee is a very simple rice porridge. Normally made with water, but can be prepared with any type of broth, stock, or milk. Congee can be thick, thin, savory, or sweet. It is a humble preparation of rice that has warmed hungry bellies all over Asia for centuries. Since my initial meeting with Chinese congee in 2005, I have grown an appreciation for all things rice. First, because it’s my husband’s favorite food group; and secondly it is a staple item for a whole foods plant based diet. I was recently trying to brainstorm ways to get more vegetables into breakfast meals. Congee came to mind, since you could make a delicious savory vegetable congee with mushrooms, carrots, scallions, etc. While I like the sound of a more traditional savory soup, I wanted to reach those people who are more familiar with a sweet breakfast. So how do we incorporate vegetables and sweetness? Use naturally sweet vegetables! 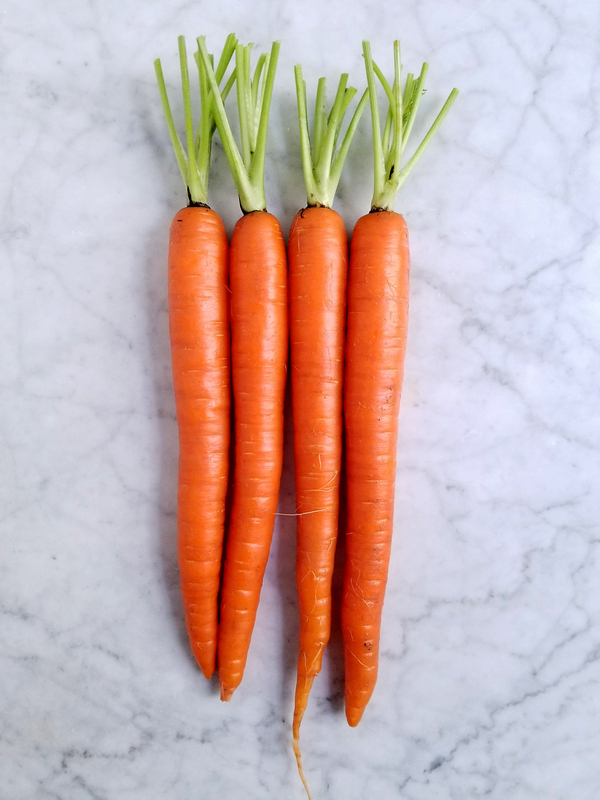 Enter carrots, raw they fill their role of crunchy savory veggie, but cooked their sugars break down and impart a wonderfully sweet taste. 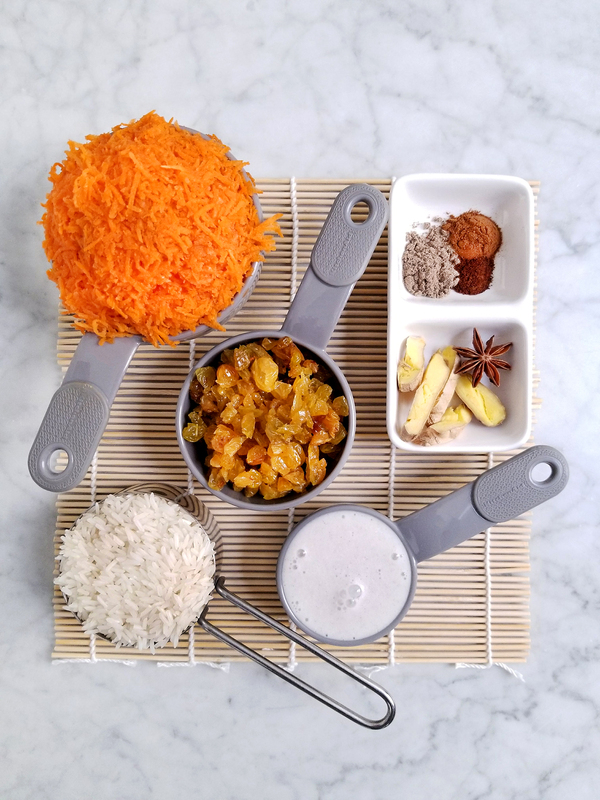 As seen in carrot cake, and my favorite Indian carrot pudding, when paired with the right spices and ingredients carrots can be an unbelievably sweet treat. 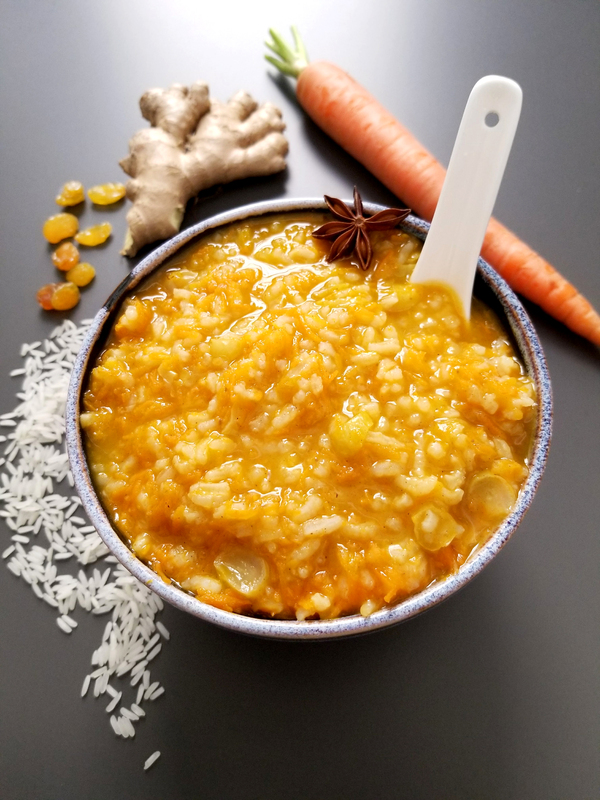 So, fusing one of my favorite sweet desserts (Indian carrot pudding) with the simple and comforting congee a new favorite was born! 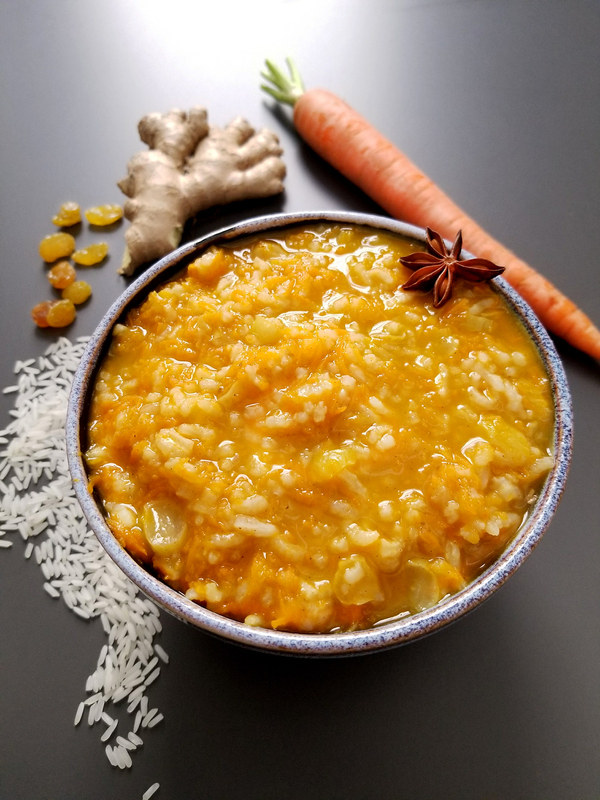 Utilizing the natural sweetness of cooked carrots and golden raisins combined with creamy rice makes this meal a perfect companion for breakfast, or dessert! With Indian spices in a Chinese soup this truly is fusion cuisine. 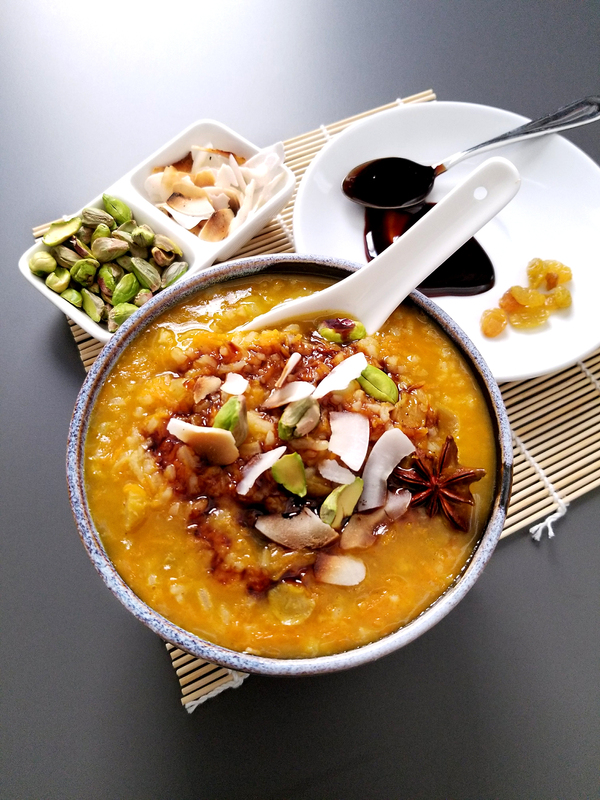 This fusion breakfast of Chinese congee and Indian carrot pudding is the perfect sweet-savory porridge to mix up your morning routine. In a medium sized bowl, place the 1/2 c. of rice and cover with water. Using your hands agitate the rice while rubbing the grains between your fingers. Drain of the murky water and fill with fresh water. Repeat this process 2-3 times to make sure the rice is clean. In a medium sauce pot, over medium heat, add the coconut milk, raisins, carrots, cardamom, cinnamon, and clove. Stir the mixture until well combined and cover for 2 minutes. Remove the lid and stir for another minute or so, the spices should be fragrant and the little liquid there is should be bright orange. 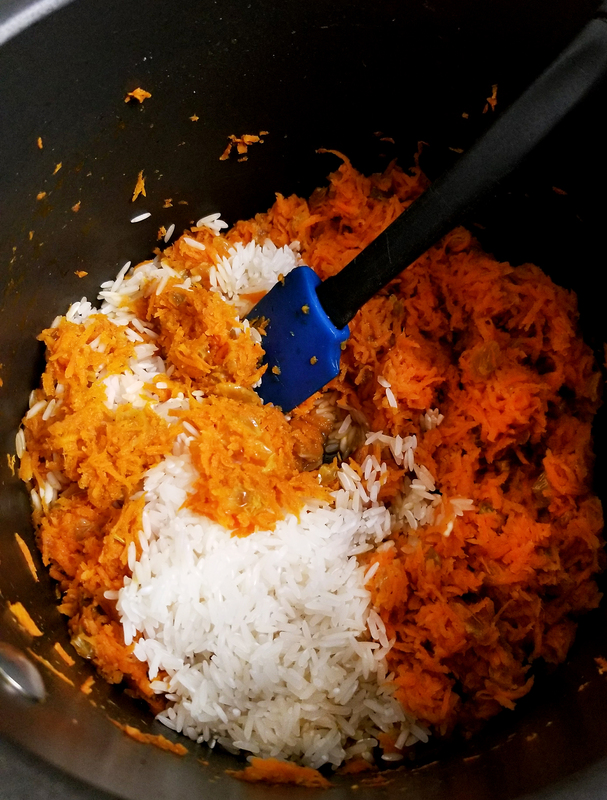 Add the rice, and stir, coating each grain with the carrot mixture. Add the water, ginger slices, star anise and bring to a boil. Lower the heat to a simmer and partially cover the pot. Let simmer for 20 minutes, stirring the rice a few times while cooking to prevent the rice from sticking to the bottom. After 20 minutes remove from heat and remove the anise pod and ginger slices. * If you want your congee on the thick side use 4 cups of water, if you want it thinner and more runny use 6-7 cups of water. *If you have never tried date molasses I highly recommend it. It is one of the best sweeteners I have ever tasted given its unique caramel and citrus notes. You can find it at your local Indian grocer or online.